Okay, okay I relented and made some mince pies. I didn’t want to as I don’t like mincemeat, but my name was down to make a couple o’ dozen for the school carol service so I had to bite the bullet and bake some for the first time…EVER! Here they are looking festive with some holly out of the garden. I must admit that it has made me venture out and try a new pastry recipe. I’m living on the edge, me. I tried the first batch out on the family at the Weekend and they seemed to go down well. Said pastry is now my favourite as it is sweet, crispy and very short. It dawns on me how sad that sounds to have a ‘favourite pastry recipe’ but such is the life of the Domestic Princess. I even put edible glitter on them too, not much escapes the glitter round here at the moment. Add lids or pastry shapes on top. You can glaze with a little beaten egg if you like. Bake for 12-15 minutes at 180-190 degrees. Allow to cool for 5 minutes then lift them out with a butter knife and cool on a rack. I made triple amounts of the above for the carol service, so I have now frozen some ready for emergency tart requirements at some later date. The remainder I put in the fridge and has been used to make a lovely apple pie and also some jam tarts for George’s school party this afternoon. PS. I do items 1 and 2 in the magimix. The mix will be very soft but just pull the crumbs together. The mincepies on Sunday were really good and I am trying out the pastry recipe today. Hope it works as well for me. Seriously you’d never made mince pies before? 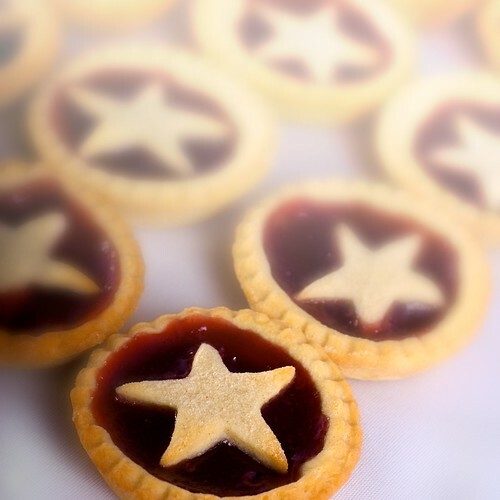 They look wonderful, I love how you’ve made lids with stars cut out of them and used the stars on jam tarts (which I bet kids like more than mince pies!!). I can imagine my Ted giving a squeal of excitement with jam tarts so I must make him some. 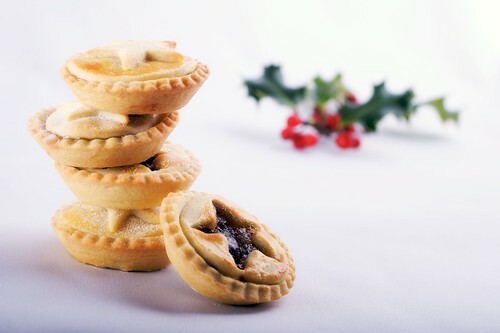 Fantastic looking mince pies. What do you use for lighting in the winter? I’m really struggling to get remotly good photos at the mo, hence why I haven’t blogged much. Oh wow…..super stunning photos. I love the Holly and I’m so waiting to take a photo like that with the berries and leaves as ‘props’. Your mince pies look perfect – well done. I shall be doing the very same this evening along with my spicy Christmas Apple Strudel (bought filo, I’m afraid) and will bake my honey & mustard glazed ham. So, keep doing what you do, it’s always a pleasure to see what you guys are up to and a lovely reminder of my old Georgian home in the North Yorkshire countryside – Christmas in the tropics is just not the same. Merry Christmas, one and all ! Love the mini pies, I will have to try this with my young audience and see how it goes. Happy Nesting.